In the royal courts of olden times, the king’s favourite was showered with rewards for making the king happy, not for making the court or country happy with the king. PR was not what Barbara de Villiers did for Charles II, nor Madame de Pompadour for Louis XV. At United Company Rusal, the state aluminium monopoly, Vera Kurochkina (lead image, left) is Director of Corporate Communications, a title she’s held since 2006. For three years earlier she was called head of Rusal’s media relations. To company insiders she is the favourite of chief executive Oleg Deripaska. According to the company’s financial report for 2014, she was paid $1.236 million. That sets the public record for PR directors in Russia’s exchange-listed, state-owned, and most heavily indebted companies. Leontyev is not a member of the company’s governance bodies, and his name, department and function aren’t mentioned in the annual report, not even in the special section entitled “Information Disclosure”. This week his department issued a release on new appointments and restructuring to “enhance [the] efficiency of [Rosneft’s] organizational structure” That continues to subordinate Leontyev at least one notch below Rosneft’s 13-member management board. 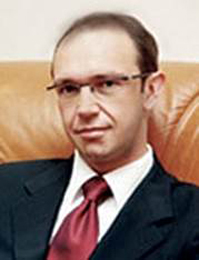 The board members include ranking vice presidents; Leontyev is not a member of the board. Gazprom’s chief spokesman is Sergei Kupriyanov (below, left). He started at the company in 2003 when he was appointed deputy head of the communications and information department. That rank today is paid by Gazprom at the rate of $5,000 per month or $60,000 per annum. Kupriyanov is still reported by Gazprom to hold the departmental deputy’s position, but with the elevated rank of press secretary of the chairman of the board. So he is likely to be getting significantly more than the base pay rate of $60,000. But he isn’t counted a member of the 17-member company management committee, where the big salaries and bonuses are paid. Neither is Kupriyanov’s boss, the head of Gazprom’s information and communications department, Alexander Bespalov (right). 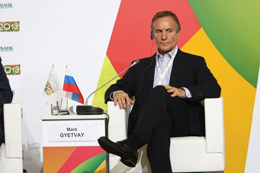 Novatek, the independent gas producer owned by Leonid Mikhelson and Gennedy Timchenko, does the unusual thing of placing its chief financial officer, Mark Gyetvay, an American, in charge of its communications and PR, with deputies for press and investor relations. That puts Gyetvay’s compensation much higher than other PR role players in Russia’s energy sector. He also occupies seats on Novatek’s board of directors and management board. But Novatek conceals how much Gyetvay (right) is paid, along with his fellow directors and senior executives. The Novatek annual report is precise about the attendance records of its board members, but lumps what they are paid into a single aggregate. That comprised Rb1.7 billion for 2014, with 30% called salary, and 70% bonuses. Gvetvay is reported as holding precisely no Novatek shares. According to the Moscow-based firm HeadHunter, the average monthly income of a PR director in the Russian oil and gas sector is Rb500,000 to Rb550,000, in total, including bonuses. That makes an annual income of around $132,000. Another source from personnel placement in Moscow estimates that bonus payments can run as high as three times salary, depending on the profit line of the company’s balance-sheet for the year. Noone is willing to estimate what bonuses are paid out when the bottom-line is in the red. Russia’s leading banks report very high salaries for their chief executives, but their press spokesmen and heads of media and communications departments are excluded from the senior management boards, and their pay packets are correspondingly thinner. Alexander Basiyan for Sberbank is almost unmentioned in the Sberbank management structure, while VTB keeps its media and investment relations directors anonymous. 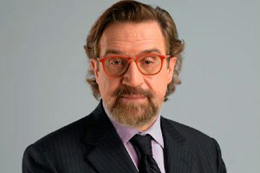 Yury Krebs, a journalist who headed VTB’s investment relations (IR) function for several years, was better known when he left last year than when he was in charge. A recently published study of pay for several categories of PR managers reports that mid-sized Russian companies are paying up to $25,000 per year, while the biggest of the multinational Russians may offer $85,000. When the PR director plays a significant role in marketing and branding for the company, the pay goes up to $150,000. The exceptional PR salaries are paid for the most profitable consumer products groups. Before the current crisis, they were reportedly peaking at $600,000. Another professional journalist to have made the move into corporate PR is Andrei Shtorkh (right). Also a Kremlin speechwriter between 1998 and 2000, Shtorkh left politics to work for Mikhail Gutseriev’s oil company Slavneft; then the MDM banking and industrial group; and since 2003 for Victor Vekselberg’s Renova holding. Shtorkh’s current title is Director for Strategic Planning at Renova “in charge of strategic communications and communications with the general public.” Renova holds a 15.8% stake in Rusal and controls another dozen businesses worldwide in energy, machine-building, transportation, real estate and finance. One of the strongest rivals of Rusal’s Kurochkina, Shtorkh has been Vekselberg’s spokesman during the long-running conflict between Deripaska and Rusal’s minority shareholders. Because Renova is a private holding, it doesn’t report its managers’ pay, and Shtorkh declined to give a precise number. 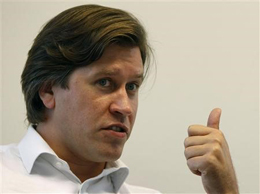 One Moscow headhunter says: “Shtorkh is both PR man and political lobbyist, with many scalps from the corporate wars on his belt. He could be getting more than $1.5 million.” Sources who know Shtorkh and Kurochkina believe Kurochkina may not hold the record after all. Oligarchs are notorious cheapskates, except for themselves, but loyalty among their underlings earns bonuses. In the Russian fertilizer sector, which is dominated by Uralkali and Eurochem owned by Suleiman Kerimov and Andrei Melnichenko, respectively, recent PR hiring has been at a maximum of Rb700,000 per month, or about $170,000 per annum – before bonus. The engagement in 2013 of Vasily Brovko (below, left) as head of communications at Rostec, the state conglomerate, was reportedly at a rate, including bonus, approaching $1 million. Norilsk Nickel, Russia’s leading mining company, appears to pay its head of PR, Larisa Zelkova (above, right), less. Zelkova, a journalist to start, has risen through Vladimir Potanin’s businesses and is now deputy chief executive of Norilsk Nickel, under Potanin as chief executive and control shareholder. Zelkova is a board director, too. The company describes her as in charge of social policy and public relations, with deputies for regular press and investment relations. The company’s annual report for last year identifies how often Zelkova sat down at the board table, but not how much she took home. Norilsk Nickel publications on compensation for board members and senior management suggest Zelkova is paid about $300,000 before bonus. 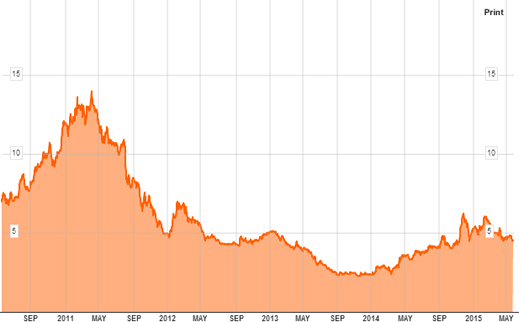 That may put her at the million-dollar mark in a good year, but still short of Kurochkina at Rusal. If Kurochkina is talking about her impact on the stock-buying audience and on Rusal’s share price, her compensation should have been heading steadily downwards since Rusal was first listed on the Hong Kong Stock Exchange in January of 2010. The Rusal financial reports show that until she was appointed a Rusal director in November 2010, her pay wasn’t disclosed. In 2011, however, she received $1.342 million; in 2012, $1.146 million; in 2013, $728,000. Her 2014 pay of $1.236 million may have set a Russian record, but it wasn’t her Rusal record. That came three years earlier. Between the start of 2013 and the end of 2014, as Rusal’s share price went from five Hong Kong dollars to five Hong Kong dollars, Kurochkina’s compensation almost doubled. In 2011, when she took home her personal best, Rusal’s bottom-line was a profit of $237 million. In 2012, when she accepted a paycut of $196,000 (15%), the company reported a loss of $55 million. In 2013, the loss widened to $3.3 billion; in 2014, the bottom-line was still in the red by $91 million. This week Deripaska and Kurochkina launched a new media promotion, this time offering to sell $1 billion in shares and convertible bonds in the EN+ holding, through which Deripaska owns 48.1% of Rusal. EN+ has already attempted to sell shares at initial public offerings (IPO) in Hong Kong of its energy group Eurosibenergo and its mining unit Strikeforce Mining & Resources (SMR); it failed on each attempt. That story can be followed here and here, and here too. These failures didn’t put a dent in Kurochkina’s take-home. These aren’t audiences on which Kurochkina’s compensation appears to depend, or on the movement of stock market and banker sentiment towards Rusal. For Rusal PR and Kurochkina’s record, it’s the messenger who counts, not the message. Reporters from Bloomberg, Vedomosti, and Kommersant, who were invited to the latest EN+ briefing, refuse to say who invited them; what drinks were served; and what role Kurochkina played in the promotion. They also omitted to ask or to report what has changed for EN+ in the Chinese market since the last investor bid petered out four years ago.